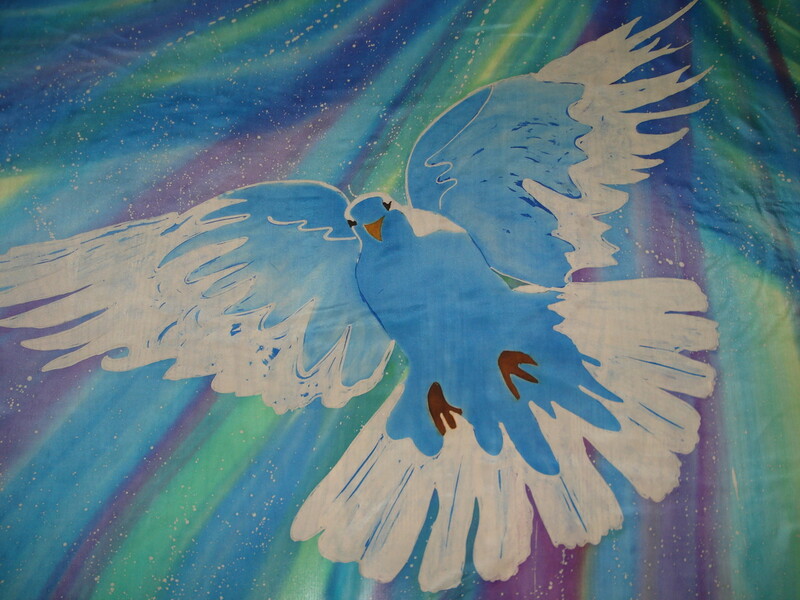 Holy Spirit Dove Flex Flag - 3 Strand Cord Silks - Glowing Silk Flags & Billows based on the Bible, Jesus and His Church, to enhance your worship of God! The Holy Spirit Dove Flag is inspired by the story of Jesus' baptism in Matthew 3:16: "And after being baptized, Jesus went up immediately from the the water; and behold, the heavens were opened, and He saw the Spirit of God descending as a dove, and coming upon Him." 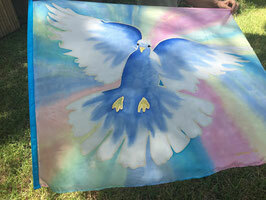 Holy Spirit Dove (3 x 3.5 ft) Medium flag with dove descending down from Heaven! Colors vary with each flag - each Dove is unique! Flexible Rod. 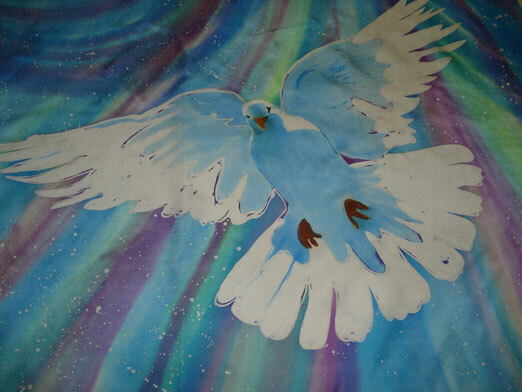 Holy Spirit Dove (3.5 x 4.5 ft) Large flag with dove descending down from Heaven! Colors vary with each flag - each Dove is unique! Flexible rod. Express your heart to see Heaven come to Earth. Intercede for those you love to be touched and wooed by the Holy Spirit! Inspired by the story of Jesus' baptism in Matthew 3:16: "And after being baptized, Jesus went up immediately from the the water; and behold, the heavens were opened, and He saw the Spirit of God descending as a dove, and coming upon Him." If there is something that you need - and you don't see it here - please contact me! Let's see if I can make what you need. Please note: All of the designs on this website are the property of 3 Strand Cord Silks! Please do not copy my designs and call them your own... if you ask the Father, He will give you your own designs =0) because He is so GOOD! !